I read this article and found it very interesting, thought it might be something for you. 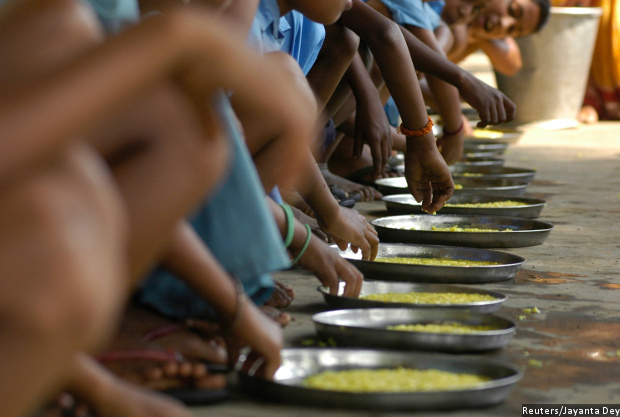 The article is called India Falls 3 Places In Latest Global Hunger Index, Ranks 100 Of 119 Nations and is located at https://archive.indiaspend.com/indias-great-challenge-health-sanitation/india-falls-3-places-in-latest-global-hunger-index-ranks-100-of-119-nations-11177. With more than a fifth (21%) of its children wasted–low weight for height–India ranks 100 of 119 countries in the 2017 Global Hunger Index (GHI), down three places from 97 last year. Only in three other countries–Djibouti, Sri Lanka and South Sudan–are more than 20% of children wasted. India ties with Djibouti and Rwanda for the 100th rank, and with a score of 31.4 of 100 (with 0 being best and 100 the worst), India’s 2017 GHI falls at the high end of the “serious” category. Published by the International Food Policy Research Institute, with Concern Worldwide, an Irish aid agency, and Welthungerhilfe, a German private aid organisation, the GHI tracks hunger worldwide, focussing on countries where hunger is an urgent issue. India’s wasting rate has not substantially improved over the last 25 years, even though the child stunting rate has improved over this period. “Given that three-quarters of South Asia’s population resides in India, the situation in that country strongly influences South Asia’s regional score,” the 2017 GHI report said. India has scaled up two national programmes addressing nutrition–the Integrated Child Development Services and the National Health Mission–but these do not yet reach enough people, the report said. The GHI report comes after the latest 2015-16 National Family Health Survey (NFHS) and cities three points of concern for child nutrition from the NFHS. First, the availability of solid food with breast milk for young children (when they transition from exclusive breastfeeding) declined from 52.7% to 42.7%. Second, the proportion of children between six and 23 months who received an adequate diet was 9.6%. Third, no more than 48.4% of households had access to improved sanitation facilities; sanitation is an important factor in improving nutrition. The GHI score is calculated based on undernourishment, child wasting, child stunting and child mortality. India’s GHI score improved from 46.2 in 1992 to 31.4 in 2017. Yet, of Indian children under five, one in three (35.7%) is underweight, one in three (38.4%) is stunted and one in five (21%) is wasted, according to 2015-16 NFHS. 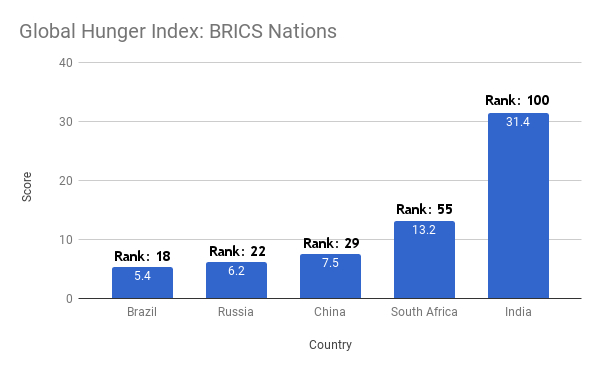 India is last among the BRICS (Brazil, Russia, India, China and South Africa) group of emerging nations. 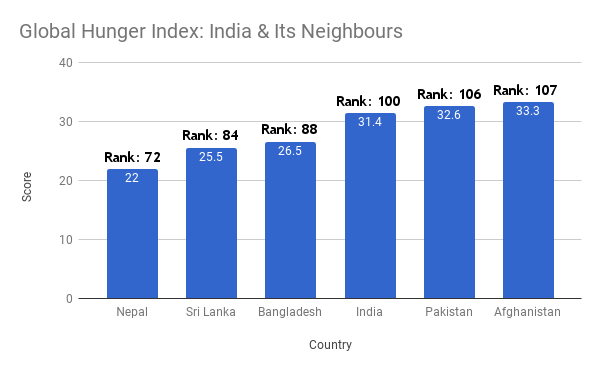 Of India’s neighbours in South Asia, Nepal, Sri Lanka and Bangladesh are doing better than India, while Pakistan and Afghanistan are doing worse.